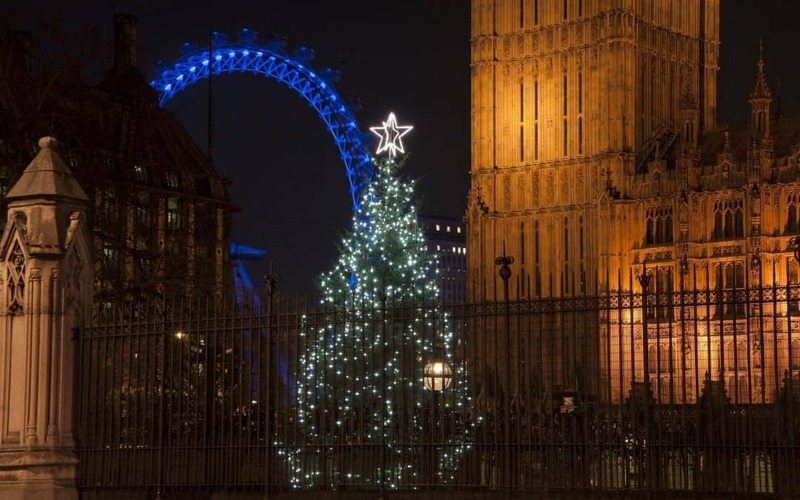 Clearly, the Capital’s leader in Christmas Light Displays, and this years kick off was 6 November and will have the lights on until 5 January, 2017. Each year who will “flip the switch” is a mystery, and this year’s Bright Light was famed DJ, Craig David. It’s the 57th year that the street has taken over in the Christmas light extravaganza and this year is no less stunning. Though this year has a charitable element. Sponsored by NSPCC and it’s “Little Stars” campaign, they are asking for a £5 donation in order to sponsor one of the 1,778 snowball and little star decorations in the sky. And just for a fun fact, there are over 750,000 LED light bulbs at work each night, be sure not to miss it. 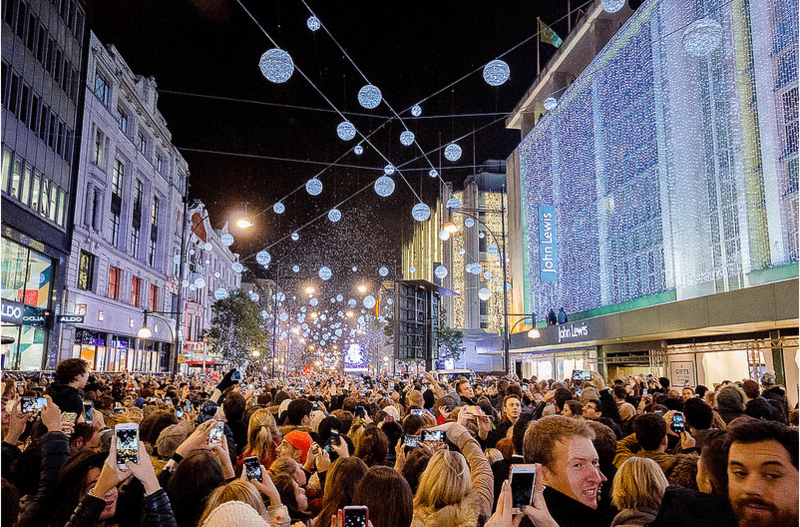 By far the Capitals biggest light display, Regent Street makes the West End the Christmas destination for getting in the spirit of the holidays. More than 300,000 lights go into the 16 spectacular spirits that fly over the street in their entire regal splendor. This is a nice spot to see the lights as it goes from one full end of Regent Street, past the end and right on into Piccadilly. Step right out of a Christmas song and purchase a bag of roasted chestnuts as you stroll past the department stores. It’s a great place to shop and to get into the spirit. So let’s call this the wrap up on the Super Elite Shopping Streets. 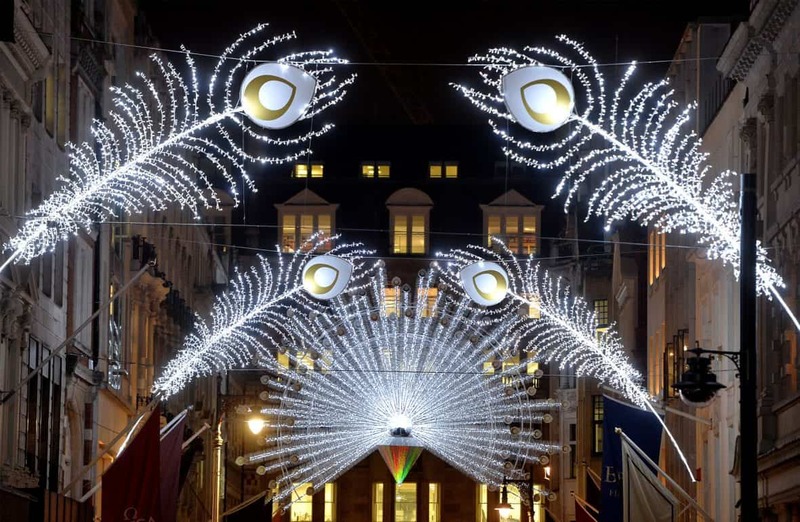 Bond Street’s world-famous department stores all pull out the stops for the most brilliant light display ever. Bright White lights in the 100’s of thousands light up the night sky and put you on the road to feeling like Santa. Though, you best be a rich North Pole resident Santa sort if you’re making this your Christmas Market for shopping for gifts. 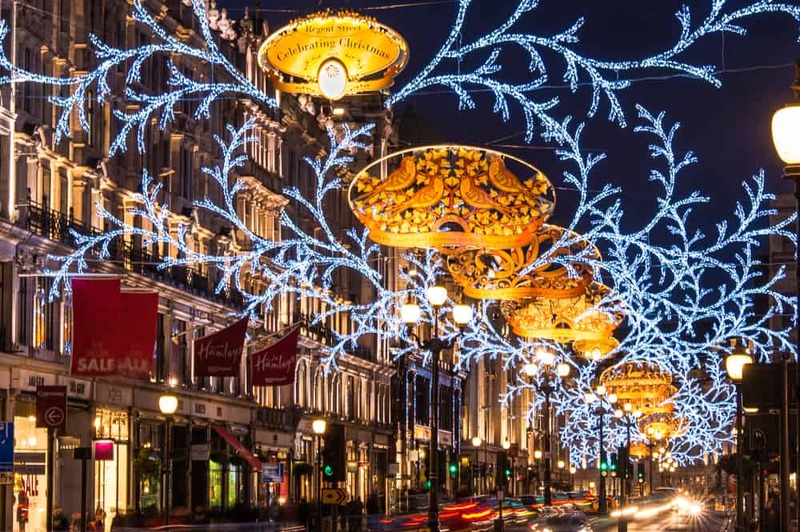 Still, you shouldn’t miss the millions of pounds worth of professional Christmas décor set in the most pleasing of manors on Bond Street. The display is themed and has over 250,000 lights including the peacock feather stars of the show. Window shopping at its very finest! 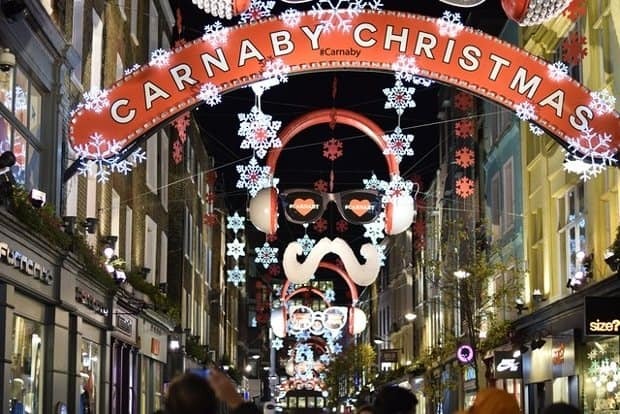 Who doesn’t plan at least one evening in December each year to take a walk through the mile long Christmas decoration display in Carnaby? 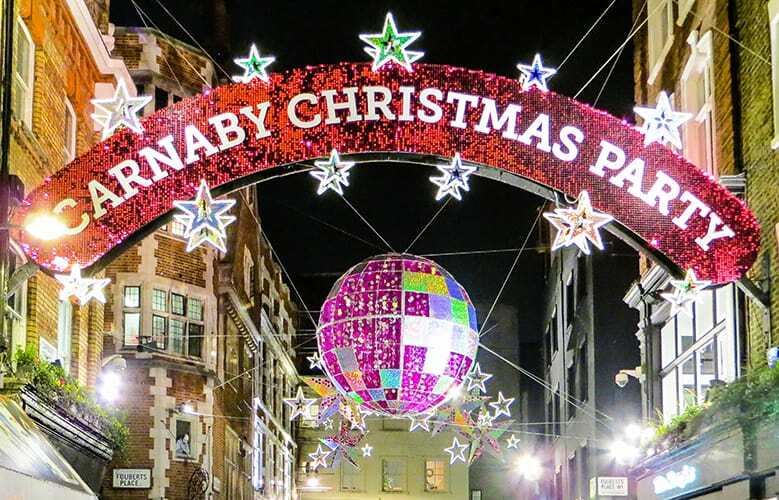 Carnaby Christmas Lights have become legendary as it’s fun to see what spin they will put upon the town each year. This year the display is done in conjunction with the Victoria and Albert Museum with their gala of “You Want a Revolution?” The theme is 60’s and 70’s Records and Revolution Exhibition. It’s a great day to go Saturday to see the exhibition and wander over for food and the lights early evening. There’s over 100 places to stop on the 13 blocks and most of them sell a pint and some grub. 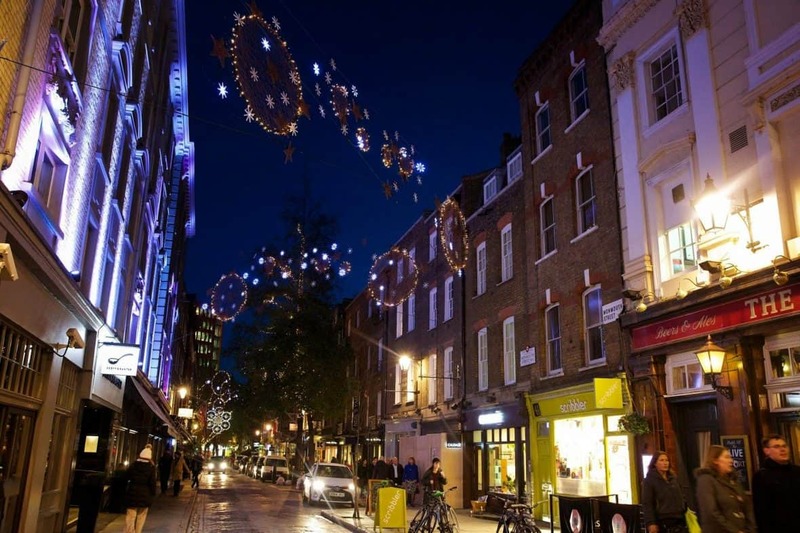 Lights stay above Carnaby’s 13 decorated streets through 8 January, 2017. 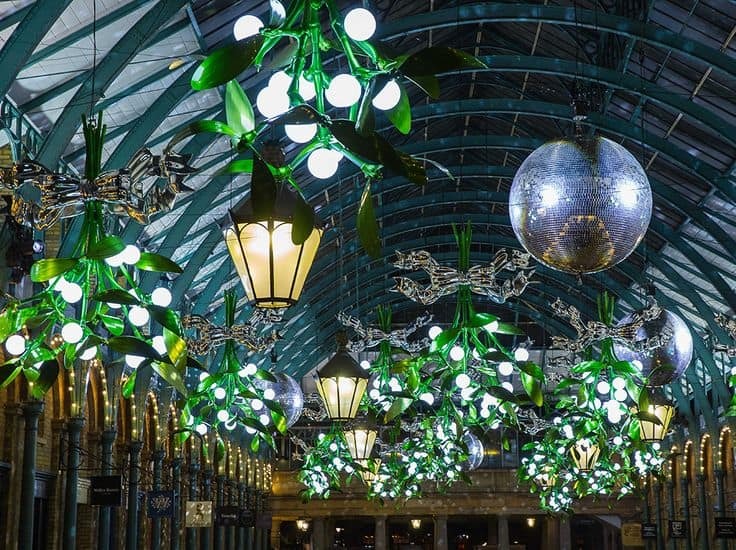 So if shopping for gifts along the cobblestones is what does it for you than you’re sure to feel right in the swing of things at Covent Gardens. The Christmas Tree is the massive star of the display and the iron work structures in the glass ceilings are picture perfect. Makes you want to stop under the suggestive mistletoe from above; Cupid Santa. 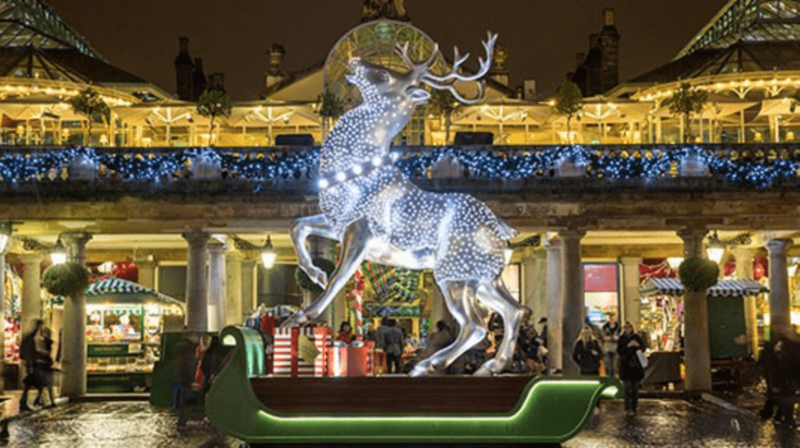 By now you’ve already missed the Royal Ballet’s performance of the The Nutcracker to the tune of Tchaikovsky, but you have plenty of time to get a glimpse of the 22 foot reindeer out front. The inner 19th century plaza is going to be covered in our Top 10 Christmas Markets next week, but while you’re there don’t forget the Opera Quarter is walking distance for plenty of food choices. This year there is a LEGO Christmas theme with lots of photo opportunities everywhere you look. 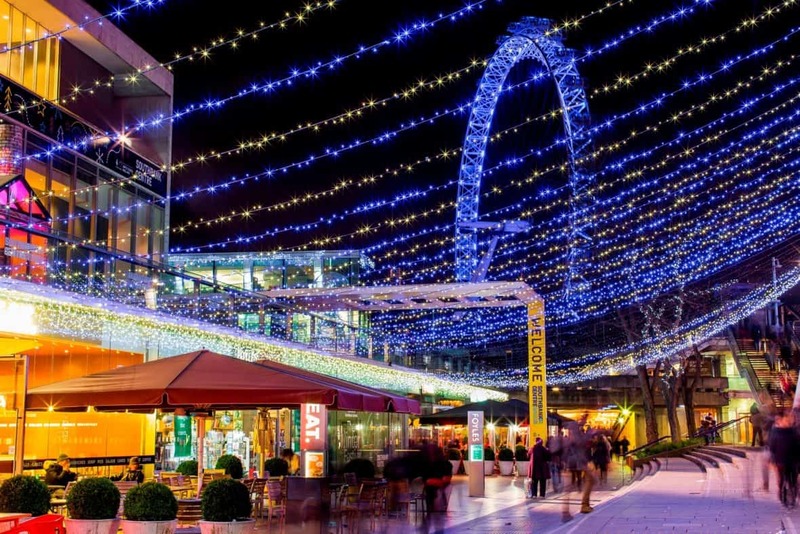 Where better to stroll with your honey than down the river’s edge of South Bank? 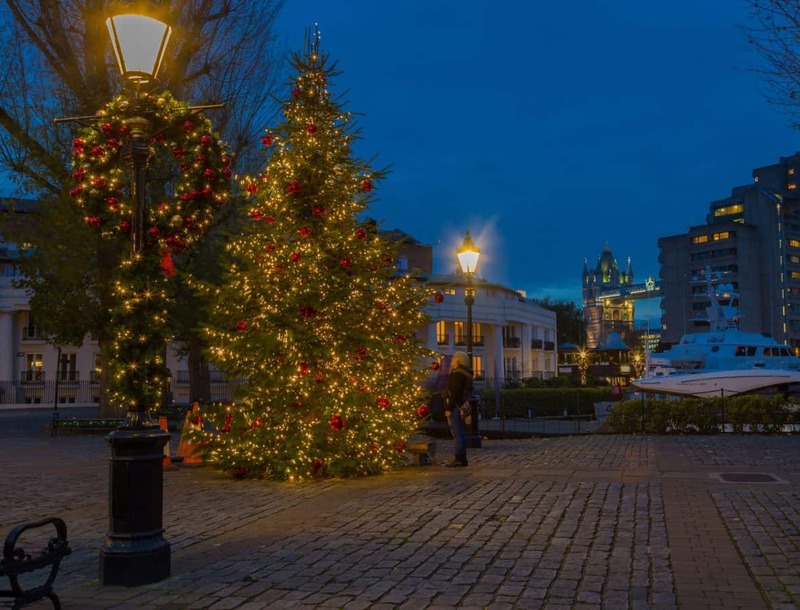 The Norwegian Embassy has donated a massive illuminated garland laden tree which is akin to hundreds of lit smaller spruce Christmas Trees along the Thames. 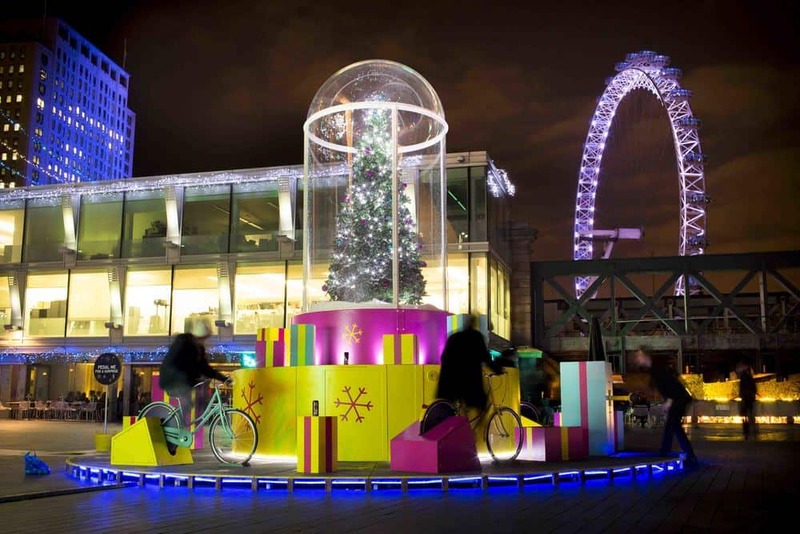 It’s quite the romantic evening or afternoon, and regardless of when you go be sure if you’re with your sweetheart that you pop for a ride on the eye, for though you think it silly we find it romantic for far too many reasons to mention. 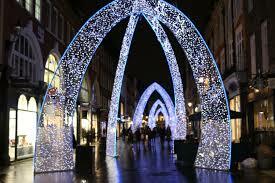 This is another spot we will cover when we talk about the Top 10 Christmas Markets next week. 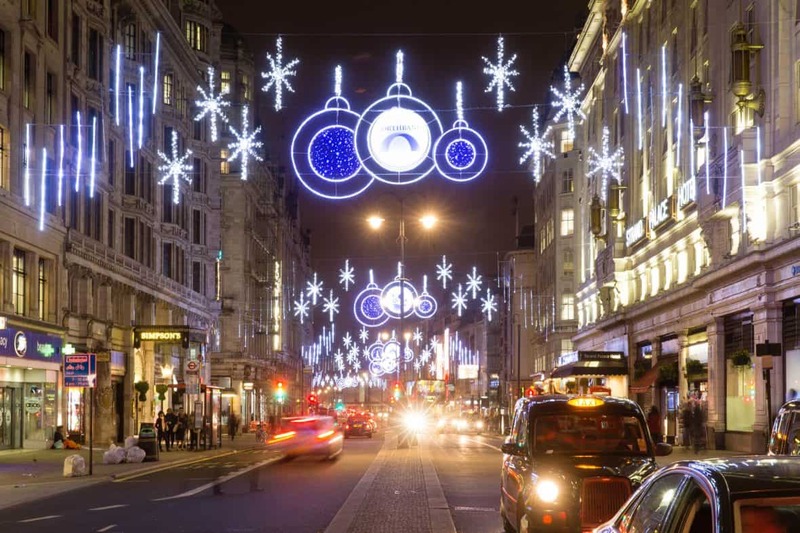 Don’t miss the second annual lighting of The Strand Christmas Display. Clearly, this will be a new addition that will be around for years to come. What’s unique about this particular installation is that it is put on with Green Technology. 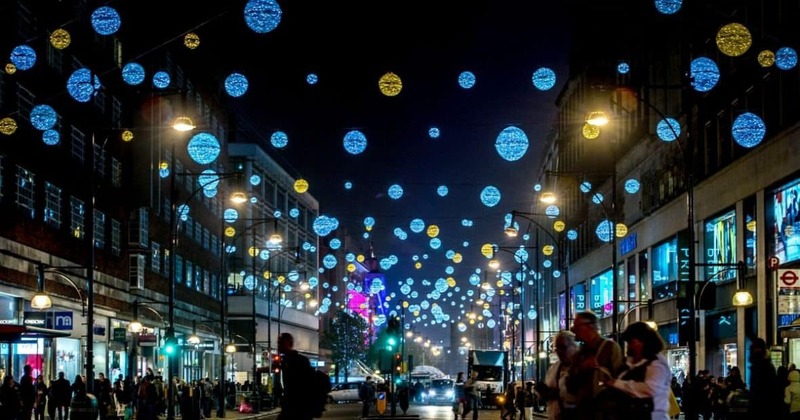 The lights at The Strand are powered by recycled and processed bio-fuel made from used cooking oils from London area restaurants. 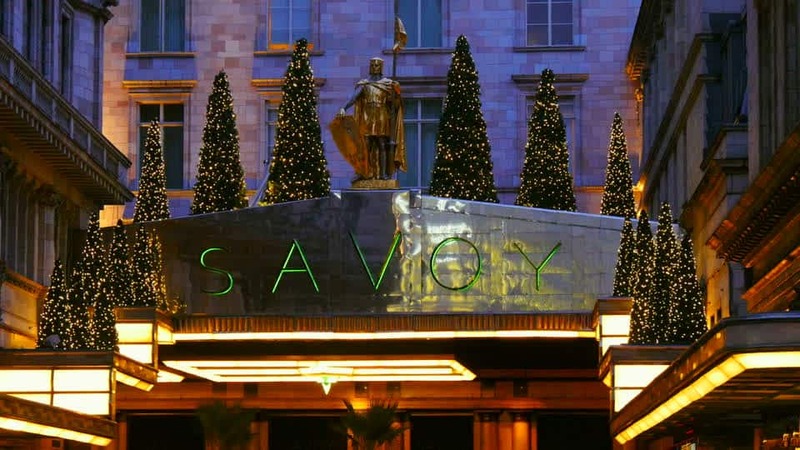 Of particular interest is the Savoy where the symmetrical line of elegant spruce are like soldiers in a line. 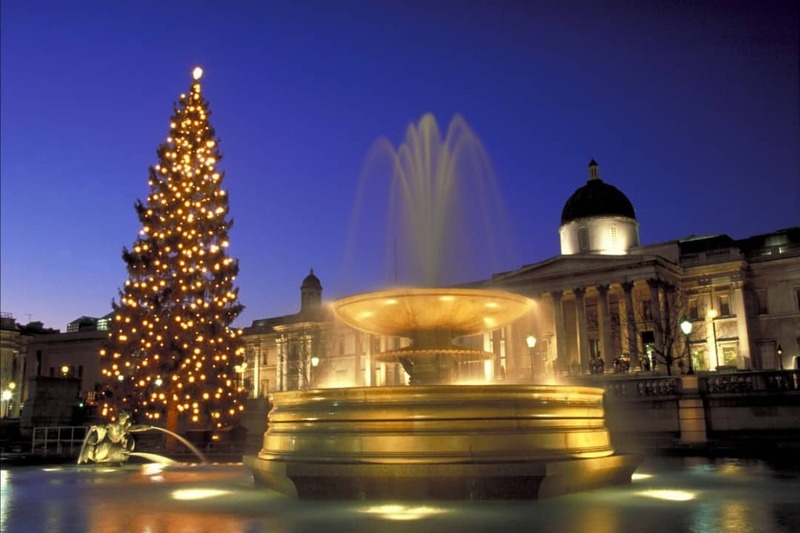 You’ve one last chance to see the Christmas Lights be turned on in Trafalgar Square on the 1st of December at dusk. See the monstrosiouty of the tree they have in the centre of the square and take some great selfies and atmosphere shots galore, for the place is sure to be picture perfect judging on year’s past. There will also be Christmas Carolers’ in the Square nightly beginning 5 December through 23 December. 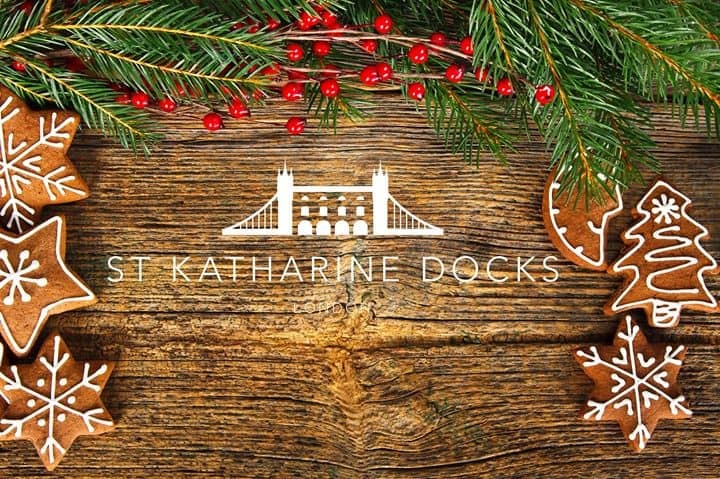 This year St. Katherines’ Dock light installation will feature a 50’ floating Christmas Tree illuminated and shinning bright. 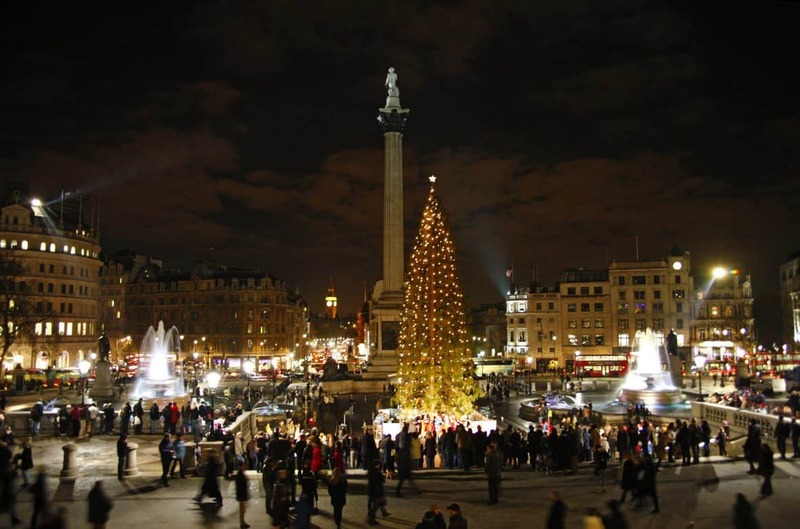 This one tree alone has over 14,000 Christmas bulbs to set it a glow. It will be moored in the West Basin area and weighs over six tonnes. The star atop this huge tree is itself five feet high, though there were no stock photo’s available for this piece, be sure to check it out. Of course The Dickens Inn is a must if you are visiting the area and as usual it’s all decked out in its five-story Christmas “apparel.” If you are taking the Tube its Tower Hill Station you want to get off at Tower Hill Station.